New hero -- Seraphina is coming now ! Seraphina was born in the Angel City of Lordran. Unlike other youngsters in this city who wish to become a priest or priestess when they grow up, Seraphina dreams of being a knight, to help others and to uphold justice. But Lordran was too peaceful a city that Seraphina decided to leave the city at her coming-of-age. She wandered around the vast land, helping those who call her for help. In one errand for a local folk, Seraphina ventured into the forest where the elves live and came across an altar. Let’s just say it was a near death experience, and after escaping from that place, Seraphina found that her two golden wings can do far more than they used to. She was grateful for this gift, and we should be grateful that this power wasn’t granted to someone evil. Blade of Justice(Ultimate): Strike a column of enemies and absorb 20% of their Attack and Defense, lasts 3 rounds. Blade Art: Strike a column of enemies and absorb 30% of their Attack for 2 rounds, also reduces their Rage by 500. Sword Flurry: Attack a random enemy multiple times while giving herself a shield that lasts 2 rounds. Defy Death(Passive): Seraphina's armored wings can protect her from certain death 1 time. Golden Legacy(Awakened): Greatly increase own HP, Attack, and Defense. Although Seraphina is a righteous warrior, her power is considered by the folks in Elysium as “wicked”. Her blade absorbs the power of her enemies to be her own. Her ultimate skill absorbs 20% of enemies’ attack and defense while her second skill absorbs up to 30% of enemies’ attack and reduces their rage. The most “wicked” part of her power is that her two blessed golden wings can even defy death, protecting her from a fatal wound in battle. Her golden wings also grants her high defense, and a shield that absorbs damage from time to time. 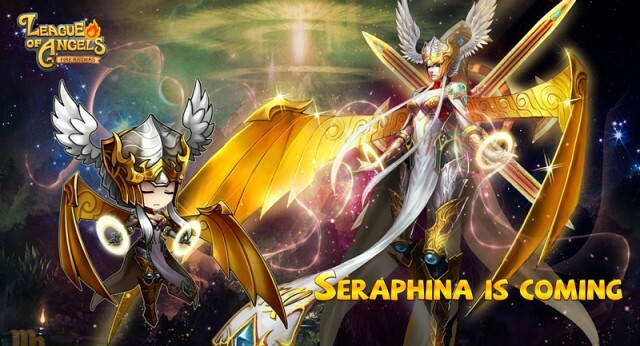 In a word, Seraphina makes a great frontline warrior by weakening her enemies and empowering herself at the same time.